The Occupy Wall Street movement in Oakland, Calif., plans a citywide general strike Wednesday. NEW YORK (CNNMoney) -- The Occupy Wall Street movement is about to enter new territory: The strike zone. By a vote of 1,484 to 46, the General Assembly of Occupy Oakland voted last week to call a citywide general strike for Wednesday. "[W]e invite all students to walk out of school. Instead of workers going to work and students going to school, the people will converge on downtown Oakland to shut down the city," the group's manifesto read. "We liberate Oakland and shut down the 1%." 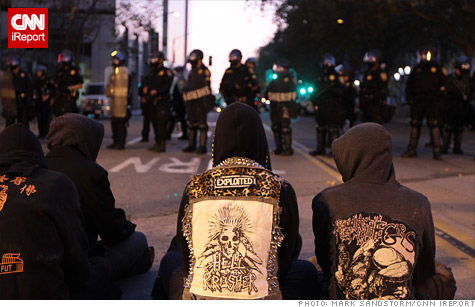 Occupy Oakland's call to strike follows a crackdown on protesters last Tuesday. Police loosed smoke grenades and rubber bullets, and Iraq war veteran Scott Olsen suffered a fractured skull after being struck by what protesters say was a tear gas canister. "Tens of thousands" will turn out for Wednesday's general strike, Occupy Oakland organizer Tim Simons predicted. Virtually all prominent local labor unions have issued statements of support, Simons said, and "we have confirmations of student walkouts throughout the city." "We even know of some motorcycle gangs that will participate." Though a mix of contracts and laws forbid major unions from officially joining the strike, determined rank-and-file will probably take part through vacation days, sick days or other furloughs, union officials speculated. "We're calling it a day of action, so we're encouraging people to participate," said Roxanne Sanchez, the president of SEIU 1021, one of the largest unions in the area. Should any employer in Oakland punish an employee for striking, they'll hear from Occupy Oakland. The group's Strike Assembly has voted to "picket and/or occupy" any companies that sanction employees for participating in the strike. Strikes by individual unions or staffs are familiar, though uncommon, in the United States, but general strikes are rare. The last true general strike occurred in 1946, according to Georgetown University labor historian Joe McCartin, and also occurred in Oakland -- a fact not lost on Occupy Oakland. About 100,000 workers walked off the job in solidarity with employees of two department stores, whose bid to unionize had been put down. The Oakland strike call shows the "historic levels of anger and frustration among lots of people," McCartin said. Various Occupy satellites will hold solidarity actions to coincide with Oakland's strike. Occupy Philadelphia is planning a 99-minute strike from noon to 1:39 p.m. on Wednesday, the duration a play on demonstrators chants that they represent "the 99%." Occupy Oakland organizers say their strike is as much about trying to take the Occupy movement to the next level as responding to recent police overzealousness. The Occupy movement has "sort of reached the limits of only sitting in squares and parks and we need to start showing the real potential of these people who are mobilizing now," Simons said. Other Occupy satellites have reached a similar conclusion. In Cincinnati, Occupy-ers have mulled striking to draw attention to their dissatisfaction with Cincinnati-headquartered bank Fifth Third, spokeswoman Kristin Brand said. While the general strike is without recent precedent in America, it has been in vogue globally of late. General strikes over austerity measures have sporadically paralyzed sections of the Greek, Spanish and Italian economies this year. European general strikers have had significantly more practice than Occupy Oakland. "Those countries all have traditions of general strikes that are more lively and up to the recent time, whereas in the United States general strikes were always more rare," McCartin said.